When we bought the house, there was an old cast iron wood burning stove (stufa) in the kitchen, with a flue pipe disappearing into the wall. 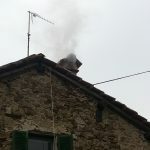 On closer inspection, the hole in the wall was blocked up with years of soot and debris, the chimney stack above the roof had been removed and closed off a few years ago according to our neighbour who dismantled it after some strong winds one year made it unstable. 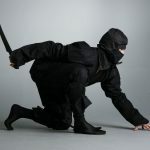 Oh and the hole in the wall was in just the exact position of where we want to create an opening to extend the kitchen. 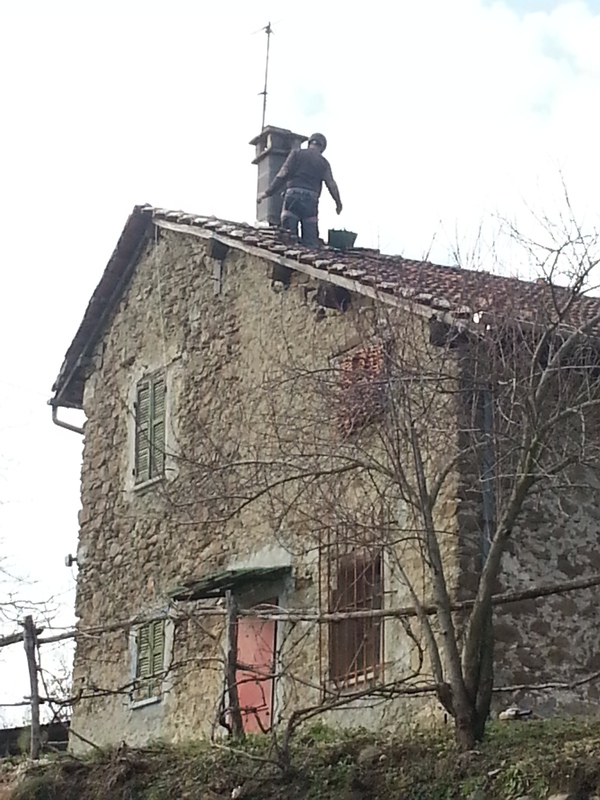 So we needed to build/install a new chimney and flue. Strictly speaking, any new installation for heating, plumbing or electrics should be installed and certified by a qualified and registered installer as in the UK. However, after explaining to the comune geometra that there was an old chimney that needed rebuilding, he advised us that it could be classed in this case as ‘maintenance’ – who is to know it is not in the exact same position – it’s a grey area! 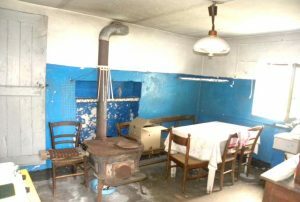 I have a few ideas I want to try in this renovation, and heating the water and reducing our heating bills is one of them. To this end we decided to run the flue pipes inside the building, running through the bedroom above the kitchen to release some heat into the bedroom, before going up into the roof space and into a ‘new/old’ chimney. 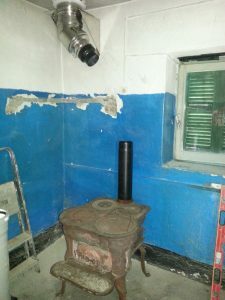 We are not yet certain whether to keep this stove for the long term as our main heating/cooking appliance, or to later purchase a dedicated wood fired kitchen oven (cucina di legna), so I selected the various flue components to allow us to easily modify the run at a later date. To ensure the weight of the flue does not sit on the stove, the main stack is held up by a couple of large brackets, which we will eventually hide with some kind of ‘extractor canopy’. Where the flue runs between floors/ceilings, it is normal practice as per the regs to use a specific fitting with exact spacing to ensure the joists are not likely to burn. Our floors and ceilings are steel and masonry blocks, so this was not really an issue – it is however necessary, to seal any gaps with fireproof expanding sealant when the installation is complete to maintain the fire isolation between floors (you may notice from the photos that we have sealing rings ready to seal in place, but just for now we have left them loose until we know how we will finish the ceiling and floor décor). Being twin wall, the flue pipe running through the bedroom will not run hot and therefore does not need further protection (single wall pipe would need enclosing with insulation and a minimum gap of 50mm before boarding over). We have seen many installations here running between floors and rooms in single pipe and no protection – hence me leaning more towards UK regs! The idea of leaving the pipes exposed is to hopefully release some of the heat into the bedroom instead of needing radiators. When we tested the stufa at normal running temperature, the external temperature of the flue in the bedroom was 20degC, so fingers crossed the theory works! We will decide whether to leave the pipes in their natural stainless steel finish or paint them with heat proof matt black paint at a later date. 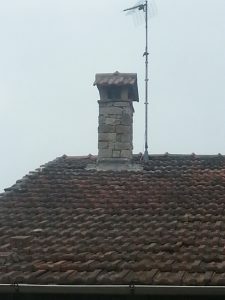 The twin wall system runs to the very top outlet of the chimney, so there are no gaps to allow gases and smoke to escape, but in my opinion this would be far too modern and ugly to be visible outside above the tiled roof, so above the bedroom ceiling I started to build the chimney section. The weight of the flue pipes is supported by the aforementioned brackets at the base of the twin wall section in the kitchen, but there is substantially more weight in the masonry section above the roof, so I installed two steel RSJ beams between the existing ceiling steel beams and the outer stone walls. On top of these, I mortared specific concrete chimney blocks around the flue pipe, and filled the gap between the flue and the blocks with heat resistant glass fibre insulation. 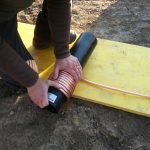 The insulation is not really to protect the surrounding areas from heat, as the outside temperature of the twin wall pipes is already fairly low (although obviously it does no harm!). 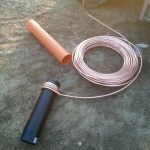 The main purpose is to maintain the temperature of the flue gases – the warmer they are inside the flue, the better the flue will work as hot air rises which ensures all the smoke rises out of the chimney. 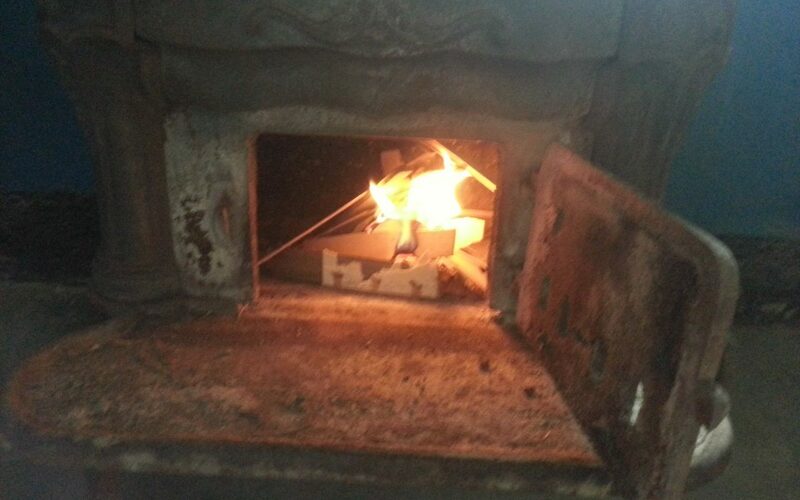 The same applies throughout the system – keep the gases burning hot (which includes burning your wood with a strong flame when possible to burn off the harmful gases – there is a science to burning the right wood for the right conditions which is way too complex for me to go into here – google it!) 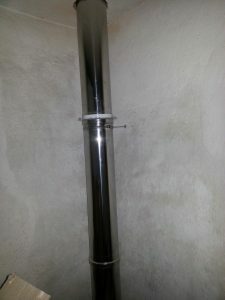 The other important part of the flue system is to keep the runs as vertical as possible and ensure the final opening does not restrict the flow. We spent quite a long time before starting the chimney 23€ to get the design right – for the look I mean. Being an old house, we wanted to have an ‘old’ chimney stack and cap, so we drove around the area looking for old chimney designs to copy. 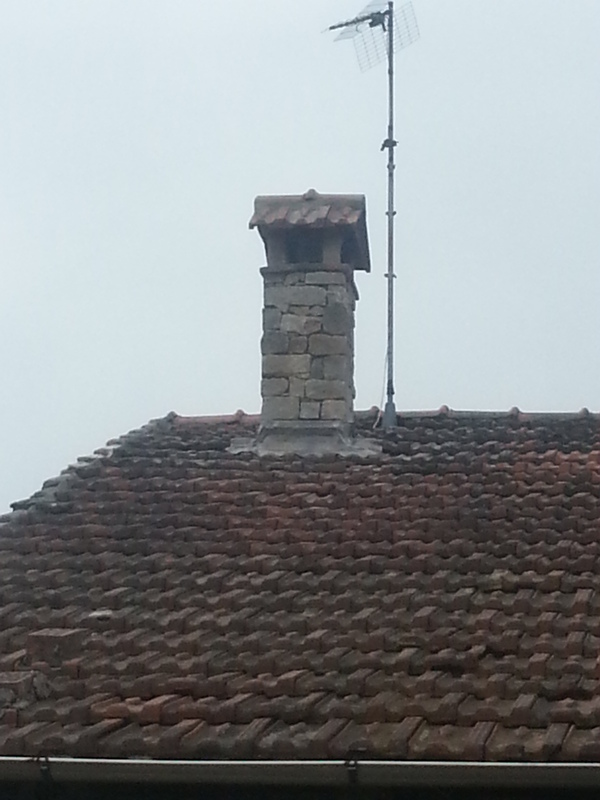 Unfortunately, most working chimney stacks we saw had been refurbished (and quite cheaply) – most were rendered. 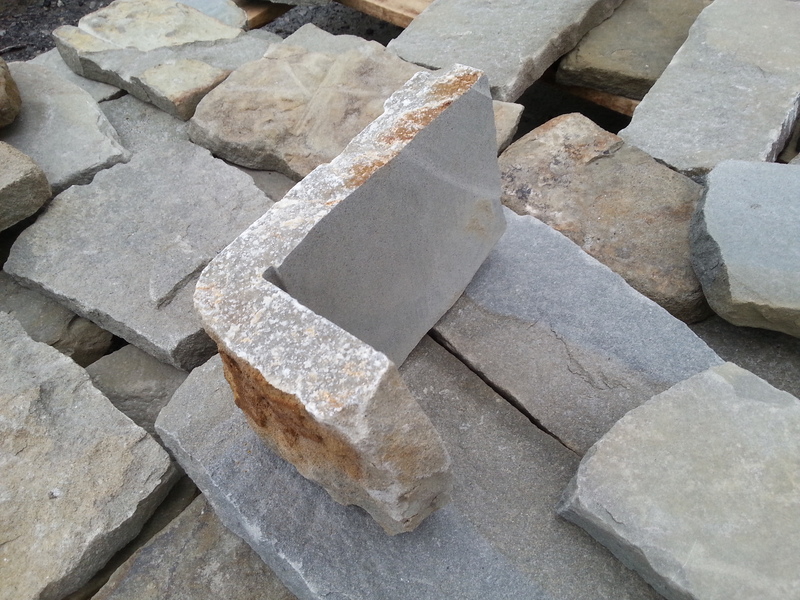 We wanted the stack to be finished in stone as it would have been originally, and capped off with tiles. 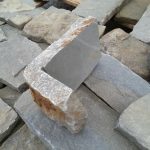 So we sourced some stone slips (stone cut into 25mm thick slices) that when attached to the concrete chimney blocks would look like real stone – a compromise between modern materials and traditional aesthetics – I think it works. We practiced on the ground for the cap design as it would be a little more precarious when on the roof! It is important to ensure that the area of the openings of the cap on each of the four sides is no less than the internal area of the flue pipe to ensure there are no restrictions that will prevent the smoke and gases escaping. The precarious bit for me whenever working on a tiled roof, is not a fear of heights, but a fear of breaking more tiles than necessary. 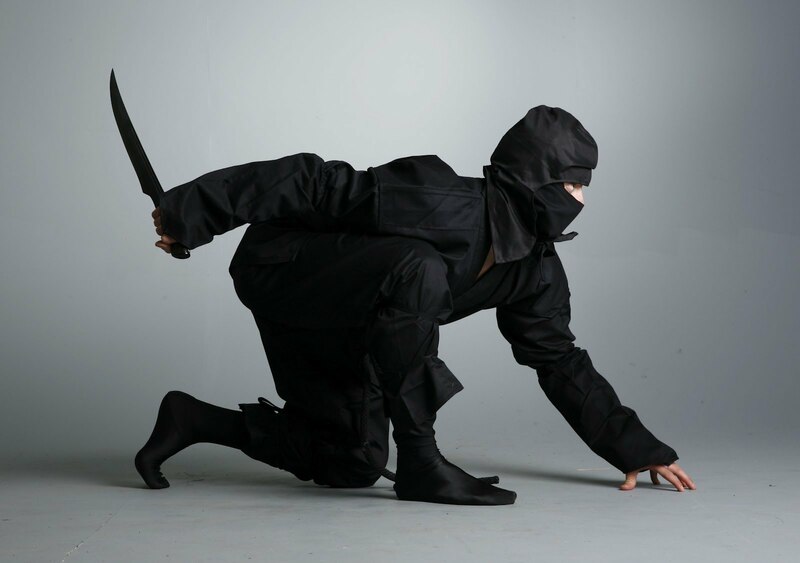 So working like a ninja, spreading my weight evenly whilst wearing black tights and a mask, I steadily constructed my masterpiece. Using external tile grout, I attached the stone slips around the chimney blocks, carefully balanced two tiles onto four pieces of stone to create the cap. 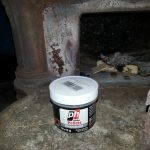 Being new tiles, they were a little too bright, so I used an old trick I learnt renovating an old stone house in the UK to blend new with old – mix some soot with yoghurt and paint it on. It dulls the surface immediately, but more importantly it encourages bacterial growth to give it an aged look after a short time. Ignore the old TV aerial! 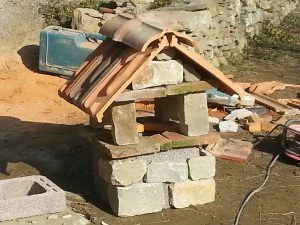 Intentionally, I placed the stone slips and tiles randomly and not particularly neatly to resemble an old construction – you just don’t see perfectly straight old chimneys do you? 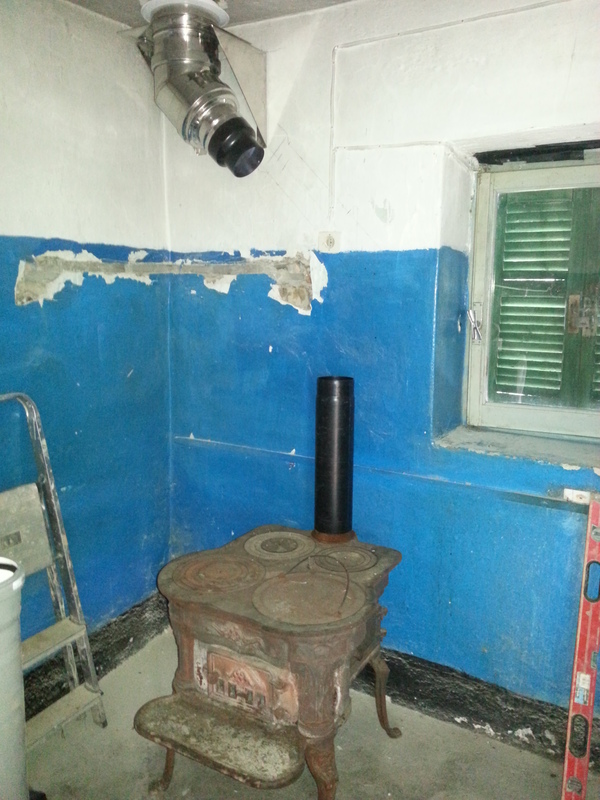 Now all that remained was to connect the stufa to the base of the flue and then test the chimney. First light a very small fire (or run a gas torch into the flue for a few minutes) to pre-warm the chimney. 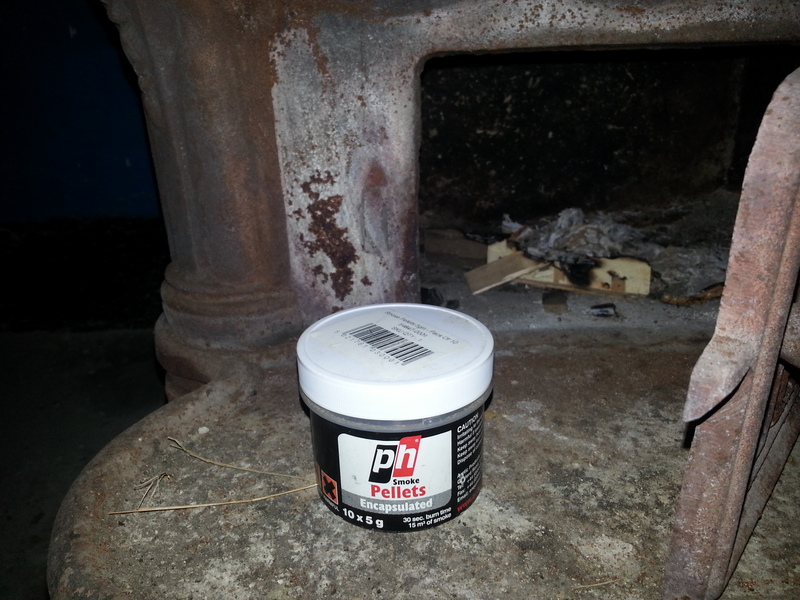 Then using a smoke pellet specifically designed for chimney testing, light the ‘bomb’ in the stove and run outside to marvel at your, hopefully working, new chimney. 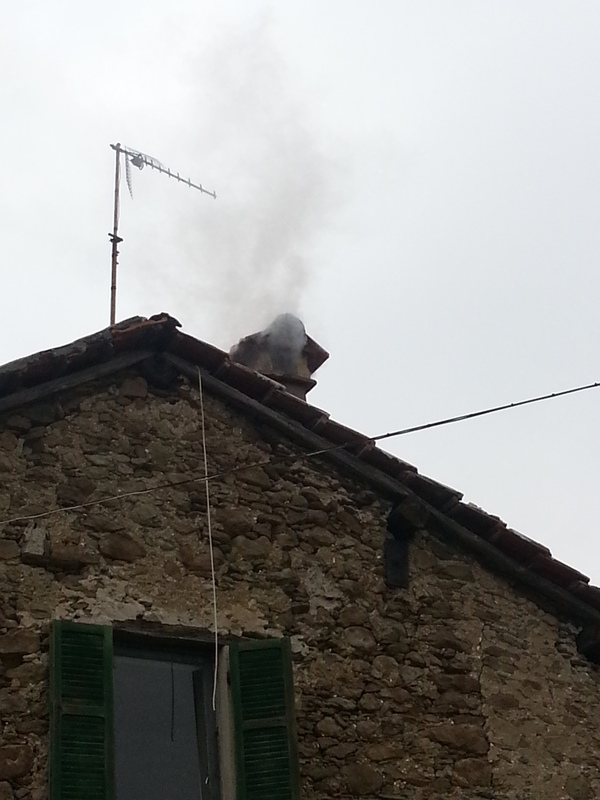 You should see white smoke belting out of the chimney, signifying that the new Pope has been chosen! Then run back inside and check the entire length of the flue that none of the joints are leaking smoke. 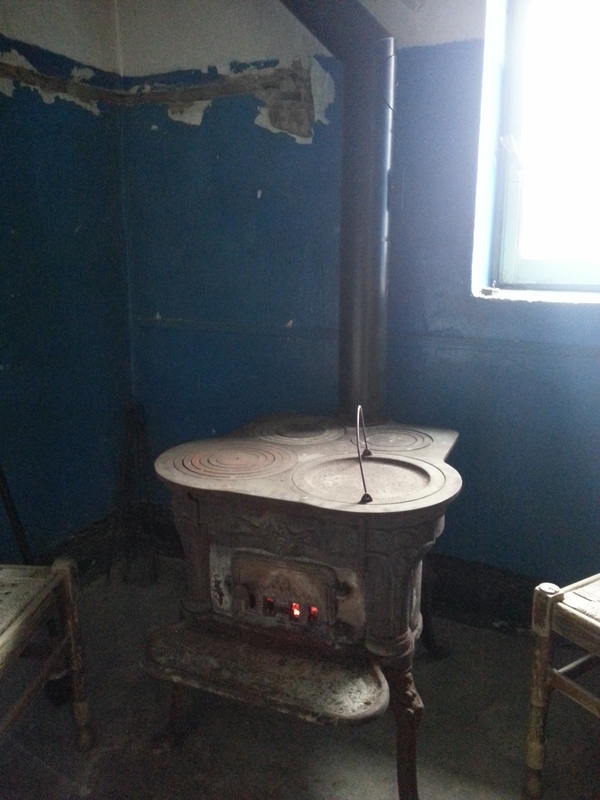 Hey presto, you have a working stove! 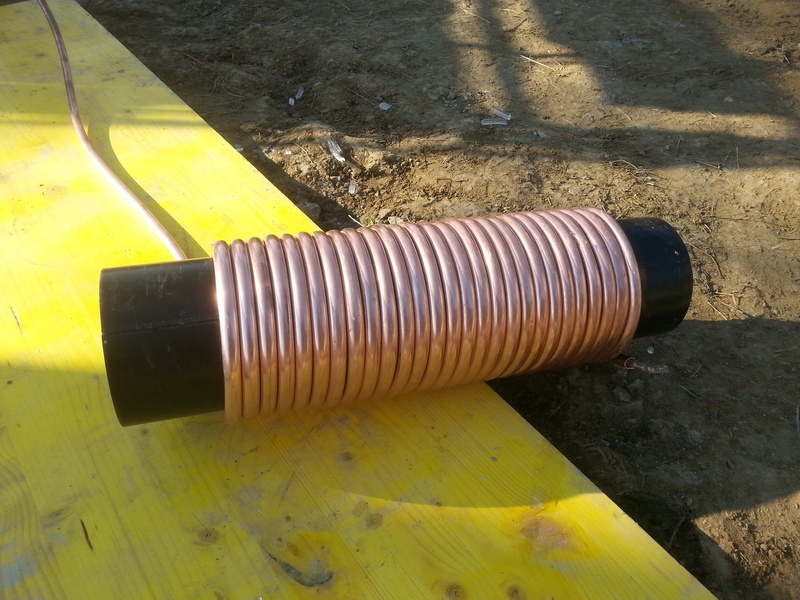 … take a roll of 12mm flexible copper tubing, fill it with water and leave it outside in winter. 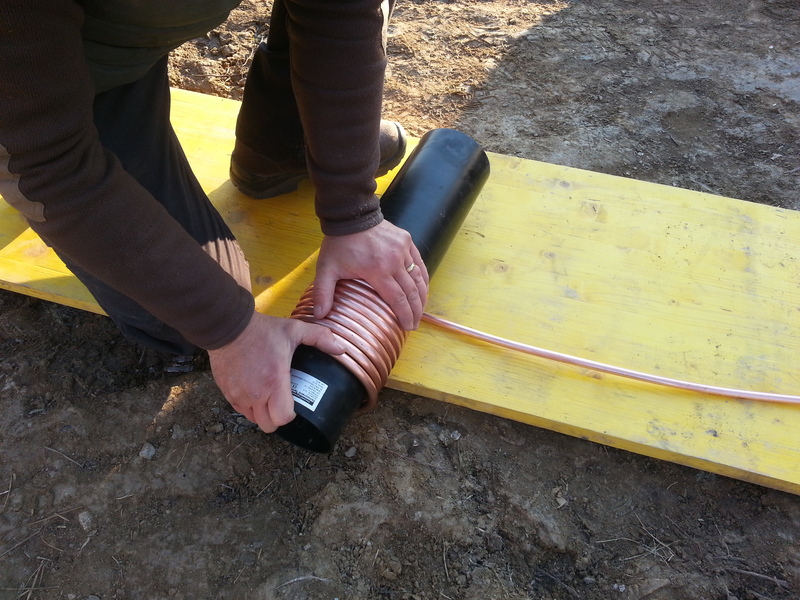 The water freezes inside the pipe which prevents the pipe from buckling as you bend it! 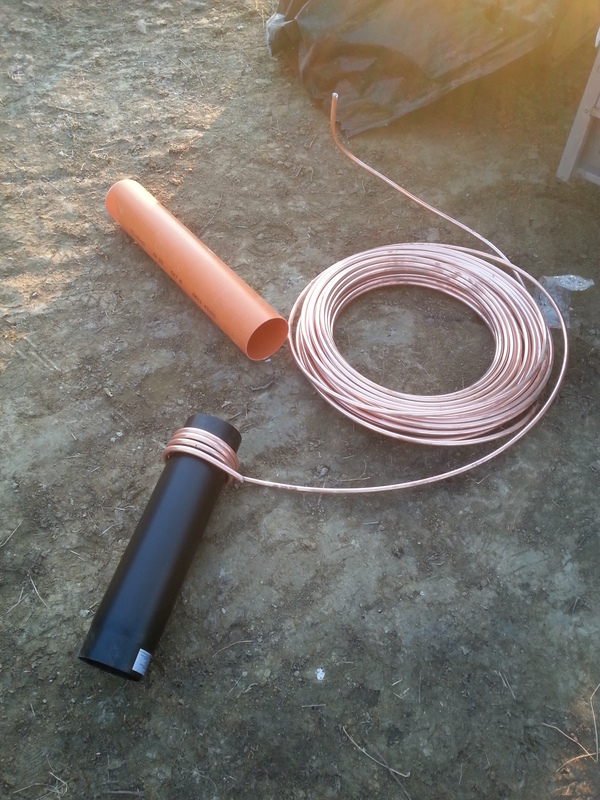 Using the flue pipe (before installing it obviously), you wrap the copper tube around the length of the flue section (the longer the better as the more contact the pipe has with the flue the more heat will be transferred), e voila! 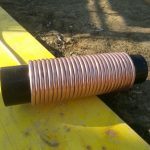 I will install this coil later this year over the flue pipe, wrap it with insulation and then slide a larger section of flue over the top to hide it before connecting both ends of the copper to the storage tank – I’ll let you know how it goes! 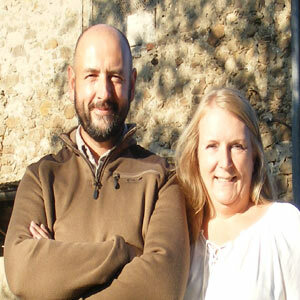 Up next … giving ourselves a ‘PATio on the back’.